Health Minister Rajitha Senaratne in conversation with the current President of Sri Lanka Medical Council (SLMC) Prof. Carlo Fonseka. 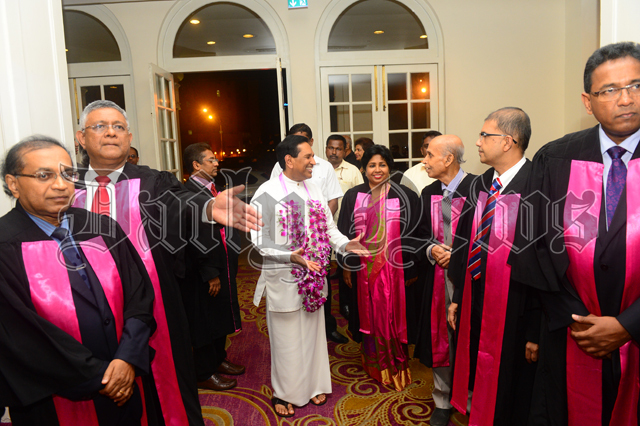 We are now in the process of equipping and establishing Cardiac Catheterisation Laboratories in every Province to minimize patients’ expenses and to reduce the waiting period for surgeries, Health Minister Rajitha Senaratne said. He said this while addressing the Sri Lanka Heart Association’s 17th Annual Academic Sessions held in Colombo recently. According to Minister Senaratne, the Health Ministry has allocated a fairly large percentage from the Health Ministry budget worth Rs.85 billion to provide free services for interventional, surgical and medical management for cardiac patients in Sri Lanka. Minister Senaratne pointed out that Government’s multifaceted efforts to fight non-communicable diseases or “life style diseases”, such as setting up healthy life style centers island wide, introducing the traffic light indication to control sugar, salt and trans-fats, restricting tobacco/ alcohol marketing etc. will help to mitigate this trend. Today, Cardiology Services are widely available in all major hospitals in the country as a result of the appointment of consultant cardiologists not only to all tertiary care units, but also to almost all provincial and district General Hospitals as well, he said. We are also now in the process of revising the procurement procedures to ensure a continuous supply of stents, balloons, catheters etc. to ensure smooth running of the newly setup chain of Cath labs. It is also my wish to upgrade the national cardiology unit at NHSL to a state of the art regional center of excellence, so that we can use the expert knowledge of our well qualified cardiologists in interventions and surgeries for the benefit of our people, the Minister said. Health Minister and Prof. Carlo have common ground except with SAITM where Carlo goes crazy to rebel against MBBS without helping according to Ordinance. Even stranger is the fact Carlo is trying to force feed Act 16/ERPM after an MBBS which it does not even recognize anyway. Who can unravel this weird paradox he has created to delay. He knows deep inside that all free state and SAITM will iron out deficiencies at the end of internship and that is not the end either. It is lifelong training of professionals as seen here in an ongoing training in advances in the world till they stop practice. Carlo making MBBS an A/L Z score. It is not. MBBS is already trained and must go into practice, teaching, administration, and community projects where there is such a crying need. Power hungry god attitude judgments must fade. All SAITM must intern. Health minister is grateful for good cardiology and allocated 85 billion from ministry budget. Prof. Carlo talking to him also should be grateful for cardiology during his 2 publicized recent hospitalisations. SAITM hospital gifted to govt. is only 3 billion but should not Carlo, let SAITM also benefit from the outcome of the 85 billion non personal govt. money meant for all citizens. Let SAITM intern, train and reap benefits meant for all doctors, without obstinate, obstructive web woven to trap govt. into a weird situation with SAITM instead of using them in service. Hearts have to be clean pumps, not hardened , calcified, fossilized to be discarded.